Last week, it was Sienna’s preschool graduation, so I decided to do something special and take her to get her hair trimmed and styled for the big day. She is almost five years old and has only gotten one trim in her life, so it was exciting to go to the salon. I took her to Devachan, which specializes in curly hair, and while I thought I had a grasp on a good, healthy curly hair routine – I figured I could learn a couple of things. Truth be told, I learned a lot, starting with all that I was doing wrong. When I made the appointment, I was instructed to wash, detangle and dry her hair before arriving to the salon to cut down on some of the prep time. Taylor, our stylist, was super helpful and informative, and the one who made me realize I had it all wrong. 1. Trimming her hair in its natural dry state is best because you can see the actual form her haircut will take. 2. Save the coconut oil for your skin! All of this time, I thought this product was good for everything, including hair. I even read on a blog that it’s best to add coconut oil before washing and detangling the hair to soften the tangles. What I learned was that oil is a repellent, so when you wet the hair to moisturize, the oil won’t allow it to really penetrate the hair – duh! It makes so much sense. 3. Only use water-based and water-soluble products, because they don’t build on the hair, are much lighter and can actually help with dehydration. 4. Sulfate-free everything. I knew this one! 5. When detangling the hair, it should be done with your hands and with small sections at a time. This sounds almost impossible to me, especially because Siena has so much hair – but it’s doable. When using a brush, you are taking out all of the conditioner while grooming; therefore, it doesn’t penetrate all of the hair and you are also breaking off more hair. While it was a bit painful for Sienna, detangling with one’s hands helps penetrate the hair with the conditioner. And, the more often this is done, the easier and less detangling there will be. 6. Sienna’s hair, very coarse and curly, should only be cleansed and washed once a week, but it should be detangled every two-to-three days. I was washing and detangling only once a week because I thought too much water would dry out her hair, but what I learned is that it’s not the water that dries; its’ too much shampooing/cleansing. I can wet, condition and detangle her hair every day, if I’d like. 7. For detangling with fingers, having the hair continuously drenched in water is key. 8. I would worry about how much of Sienna’s locks would fall out when detangling, but I learned this is normal – unless her hair breaks because of the brush. We lose about 100 strands or hair each day, but for curly hair, the strands stay stuck in the bed of coils, so when detangling they all come out. As you see, I had so much to learn, but now I feel like I have so many more tips to continue my journey in being a curly-haired pro. 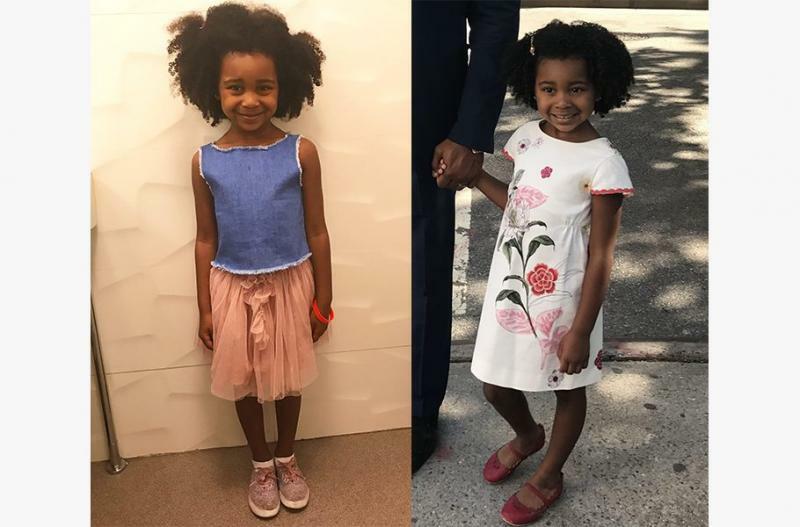 One thing I do know is that my main mission is to make sure Sienna loves her curly hair, so I will do and learn whatever it is to continue on this path – and that includes NOT straightening her curls until she is much older and in love with her natural hair.